Nearly one year after I wrote a preview for the first Ace Attorney Investigations, I have finally finished the actual game. Forgive me, I had to do so many other updates and play so many other games before I could reach this one. Anyhoo, scroll further down to get to the review. CREDITS: 2010 Capcom Co., Ltd. Screenshots courtesy of Amazon.com. I was supposed to do a review on Gokusen manga, but I accidentally stumbled upon this DS game on Amazon.com. Those of you who've read my Phoenix Wright reviews would know that I am absolutely in love with the Ace Attorney series. 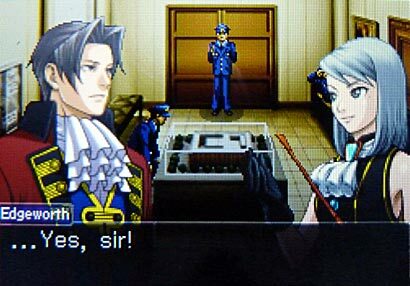 While I wasn't too happy with the characters in Apollo Justice, I'm glad that Miles Edgeworth, who was part of the original Phoenix Wright cast, is back. 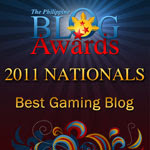 This is definitely a new reason for me to get re-acquainted with my Nintendo DS! Ace Attorney Investigations: Miles Edgeworth will be released in February 2010. You can read more of this game's features here. A few years ago, news broke out that the next Ace Attorney installation will star rising scientist Emma Skye as the lead. Apparently, fans all over the world begged for the star to be Miles Edgeworth instead. I think CAPCOM made the right decision, because I don't have any affinity with Emma Skye at all. I missed Phoenix Wright, the original Ace Attorney, who was (quite tragically) succeeded by Apollo Justice. I had also stated in my Apollo Justice review that I wanted to see Prosecutor Edgeworth again. Though Apollo Justice was by no means a bad game -- the gameplay elements were superb -- I think it wasn't worthy of Phoenix Wright. My sister even went so far as to state that it should never have been added to the storyline at all. Raise your hand if you want a retcon! Yay! 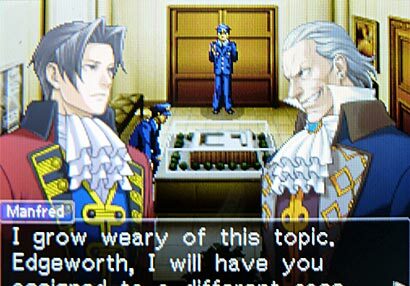 Bring Miles Edgeworth, Phoenix's most noteworthy opponent (and the only one I can remember besides Franziska von Karma and Godot), and you're assured of a most interesting ride. See, the difference between Phoenix and Miles is that the former is known for just accidentally tumbling into the facts while the latter has always been methodical and organized. You can actually feel the difference. I remember that Phoenix's logic is all over the place and I usually solve stuff through sheer guess work. Often, I've already deduced what happened and whodunit, but I've had to go through a wild goose chase to get there. With Miles, you can clearly see where his logic leads. Very organized indeed. I don't particularly know what changed as logic isn't a tangible thing, but I definitely felt Miles's cocky confidence. Of course, he can make mistakes but he always keeps in character. I may have to congratulate the game scriptwriter for this feat. The characters remain unchanged, but there are certain points during the game that will take you back in time. I just had to capture the images of the younger Miles and Franziska. They are just so cute! At the end of Case #4. Adorable! As for the gameplay -- except for the evidence, arguments and rebuttals -- this is a huge improvement from Phoenix Wright and Apollo Justice. There are no courtroom dramas, but there are a lot of on site investigations. Miles, at least, has the authority to go to crime scenes and examine the evidence, unlike Phoenix and Apollo who sometimes make me cringe as they keep touching things they shouldn't touch. The gameplay here becomes RPG-esque. You can control Miles and any of his assistants as he walks around, examines objects and talks to people. This makes the game a lot more interactive than what we had gotten used to. Of course, I miss the courtroom and the scientific tools that let you blow on the mic and scrub with the stylus, but I'm pretty happy that Miles can actually move from one place to another. These new gameplay elements actually make Miles Edgeworth: Ace Attorney Investigations longer than the previous Ace Attorneys. I couldn't finish this in one sitting, especially since the last case stretched longer than I cared to play. (Too many people persistently butting in; things already got annoying). Don't think the pacing drags, though. The dragging part occurred only during that very last chapter of the last case. The rest of the cases are actually well developed. 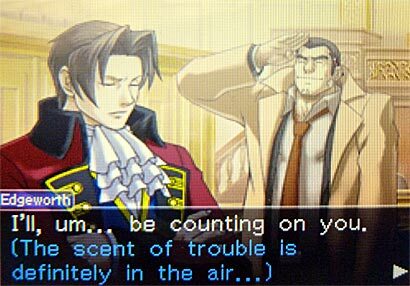 In fact, I was afraid everything would end on the fourth case since Phoenix Wright usually tackles four cases per game. Seeing all these -- and the fact that my beloved characters are back -- makes me really excited about the second Miles Edgeworth game. I heard its Japanese debut will be on February 2011, which means I will have to wait a wee bit longer before I get my hands on the English version. Visual novels are proof that video games can tell story just as well as other more traditional media, and the thing I always liked about the Ace Attorney series is that they were a visual novel that got quite a bit of mainstream appeal in the United States. As long as the story isn't as boring as Xenosaga, visual novels are ok with me. I like the interactivity of the last Ace Attorney game (Apollo Justice). I wish all visual novels would be like that. I normally like games for their mechanics, but Xenosaga didn't even have fun mechanics to abuse and break. And Xenosaga had a bleh story anyway. It's a shame because it had a lot of Nietzsche principles in it. It's a case of badly applied theoretical framework. I just finished playing the game...apparently, this is no longer just a visual novel anymore. You actually get to move Miles around. Heh.